Navigator of the Seas, one of Royal Caribbean's very large Voyager Class ships, is filled with fantastic entertainment venues, a bunch of great dining options and so many things to do that you'll never want your cruise vacation to end! 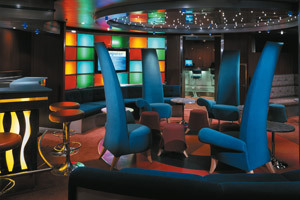 While on a Navigator of the Seas cruises, guests are able to enjoy a wonderful variety of dining venues. 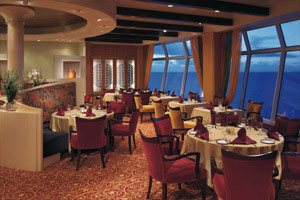 Among them is the three-level the main dining room (where guests can be placed in either an assigned or open, called My Time, dining format), Johnny Rockets® '50s-style diner, a couple of upscale specialty restaurants (Portofino and Chops Grille), and the Windjammer Café (which has a large buffet). Also available is 24-hour room service, a great option for those that would like to have a snack in the comfort of their stateroom or suite. 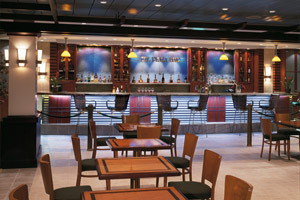 There are many bars and lounges aboard Navigator of the Seas. 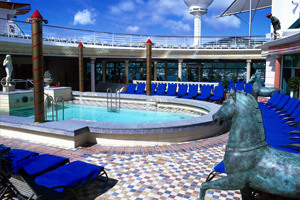 For instance, Royal Caribbean signature venues are the Schooner Bar, Viking Crown Lounge, and the Latin-themed Boleros Lounge. 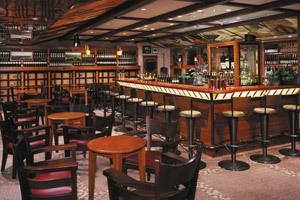 Other venues on this ship are The Dungeon, a two-level night club that's often lively way into the night and early morning, as well as the Sky Bar and Two Poets Pub (a traditional pub with a nice variety of beers and liquors). Royal Caribbean has a fantastic youth program available on all Navigator of the Seas cruises, called Adventure Ocean®. There is a great number of activities that take place throughout the cruise, supervised by the ship's well-trained staff members. Also on board is a video arcade, a teen-only disco, and a laid back teen-only lounge. Navigator of the Seas received many onboard upgrades and additions on December 2, 2013. Among the enhancements were an outdoor movie screen, updated Vintages wine bar, new restaurants (including Park Café, Chef's Table, and Giovanni's Table), digital signage, pervasive Wi-Fi, flat-screen TVs, a nursery, Concierge Club and Diamond Lounge. FlowRider, Royal Caribbean's fun surf simulator, was added. Staterooms also received upgrades. Some interior staterooms were converted to virtual balconies. These special staterooms have a wall size LCD screen that displays a constant live feed of what's going on outside. Select oceanviews had their windows expanded to reach all the way from floor to ceiling. 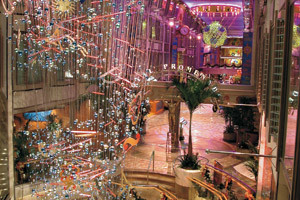 A four-story mall-like venue, the Royal Promenade is one of the most popular areas aboard Navigator of the Seas. Among the stores, bars and casual dining venues in this area are Café Promenade, Ben & Jerry's®, Two Poets Pub, the Champagne Bar, Vintages, a fashion boutique, general store, and a perfume shop. This multifunctional area of the ship is where a ice-staking rink is located. 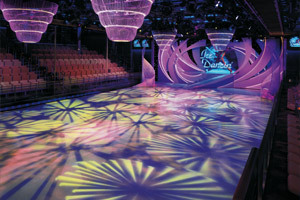 During a Navigator of the Seas cruise guests are able to skate there, as well as watch entertaining performances during select evenings. Guests sailing on a Navigator of the Seas cruise that would like to feel a rush should consider trying to climb up the ship's large rock wall. There are paths of different difficulties, making it so that guests of various skill and comfort levels can enjoy this area of the ship. If you're feeling lucky while on a Navigator of the Seas cruise, you may want to visit the ship's Vegas-style casino. Games available at the casino include blackjack, roulette, poker, craps and a variety of slot machines. Typically during a cruise there are tournaments such as Texas Hold'em that take place, which can be quite fun and exciting! 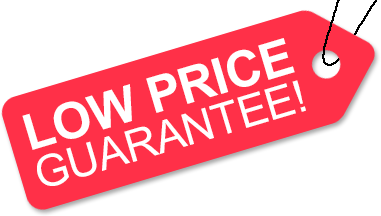 Low Price Guarantee on all Navigator of the Seas Cruises! Book any Royal Caribbean cruise with us and you'll get the best deal possible, regardless of the ship or sail date! Because of our "Low Price Guarantee," nobody beats our Navigator of the Seas cruise prices, so look around and you're sure to find the best Navigator of the Seas cruise deal possible when booking with us! Pre-Paid Gratuities on Navigator of the Seas Cruises! Navigator of the Seas Onboard Credit Sale! Get an Onboard Credit when you book a Navigator of the Seas cruise with us. The value of the Onboard Credit depends on the particular cruise and accommodations you book. Onboard Credit values are listed on Step 3 of the online booking process. We do not charge booking fees on any cruises! 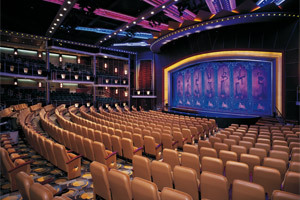 You're sure to enjoy an affordable Navigator of the Seas cruise when booking with us! Our special offers on Navigator of the Seas cruises may not be combinable. Certain restrictions apply to each offer. View terms and conditions during the online booking process. Click a price below to view the Navigator of the Seas cruises during that month in that destination. Separate bedroom with king-size bed, private balcony with hut tub, whirlpool bathtub, living room with king-size sofa bed, baby grand piano, and concierge service. Two bedrooms with twin beds that convert to king-size beds (one room with third and fourth Pullman beds), two bathrooms (one with shower, one with bathtub), living area with double sofa bed, private balcony, and concierge service. Queen-size bed, private balcony, separate living area with king-size sofa bed, private bathroom with bathtub, separate shower and bidet, and concierge service. Two twin beds (can convert into king-size), private balcony, sitting area (some with sofa bed), and concierge service. Two twin beds (can convert into king-size), private balcony, bathroom with bathtub, and a sitting area. Two twin beds (can convert into king-size), private balcony, sitting area and a private bathroom. Two twin beds (can convert into king-size), private balcony, sitting area with sofa, and a private bathroom. Two lower twin beds that convert to Royal King, measuring 72.5 inches wide by 82 inches long. Double sofa bed. Curtained section with bunks beds, and vanity with sitting area. Private bathroom with one and a half baths with shower. Floor to ceiling wrap around panoramic window, 76 inches high by 253 inches wide. Two twin beds (can convert into king-size), additional bunk beds in separate area, separate sitting area with sofa bed, and a private bathroom with shower. Two twin beds (can convert to king-size), sitting area with sofa, vanity area and a private bathroom. Two twin beds (can convert into king-size), sitting area with sofa, vanity area, and a private bathroom. Stateroom with a Virtual Balcony, a high-definition screen that spans nearly floor to ceiling, providing real-time views of the ocean and destinations. Two twin beds that convert to Royal King, sitting area with sofa, and full bathroom. Bowed windows with a view of the Royal Promenade, two twin beds (can convert into king-size), sitting area with sofa, vanity area and a private bathroom. Deck plans are subject to change. The deck plans of Navigator of the Seas provided on this page represent those from February 16, 2014 through April 5, 2015. 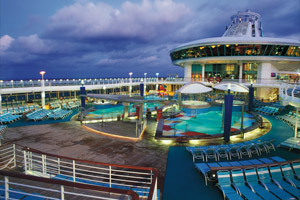 For deck plans prior to or after this date range please contact Royal Caribbean directly. We reserve the right to correct errors. Please verify all information with the cruise line directly.